This post will be a quick one. Because this is a quick salad. The kind you throw together to bring to a BBQ or you make on a Sunday night for a week of lunches. It’s easy. It’s tasty. It has wheat berries in it. Oh, yeah, wheat berries. Like how I just snuck that in there like it was no big deal? Like I eat wheat berries all the time. Ha! Tricked ya. I don’t eat wheat berries all the time, believe it or not. Actually, this was the first time a berry o’ wheat has ever graced my kitchen. They showed up in my CSA box a few weeks ago, and embarrassingly enough, I thought they were groats. (You know, like oats before they are rolled and put in a cardboard tube?) I knew very little about wheat berries, except that they could be ground up to make wheat flour. But, frankly, that seemed like a waste when I have a 10-pound bag of whole wheat flour in my pantry. I wanted to experiment. And experiment I did. It does, however, take some of the risk out of it when you’re using an Ina Garten recipe, because everything she does is fabulous, right? Suffice it to say this salad was appropriately fabulous and instead of wondering how the heck I’m going to use all these wheat berries, I find myself concerned that I will run out before I’ve done everything that there is to be done with the little buggers. Cooked wheat berries are flavorful, chewy, and the perfect base for a salad like this. Reading the ingredient list left me a bit skeptical because it seemed a bit too simple to be anything special, but turns out it’s just right. A simple dressing of olive oil and vinegar gave this much more flavor than I imagined, and the crisp, crunchy bits of green onion and bell pepper was just perfect. This single batch made a great side for a few dinners, and topped some leafy greens for a few lunch-time salads, as well. In short, a versatile salad that would be pretty much perfect any time of the year, with all manner of meals and snacks. And since I promised a quick one, that’s all I have to say about that. Full disclosure: The only thing not quick about this salad is cooking the wheatberries themselves. It is NOT, however, labor-intensive. It doesn’t take much longer (or more effort) than cooking up some brown rice. If you want your wheat berries a bit softer, cook them for a bit longer than the 60 minutes listed below. Place the wheatberries and 3 cups of boiling salted water in a saucepan and cook, uncovered, over low heat for approximately 60-70 minutes, or until they are soft. Drain. Saute the onion in 2 tablespoons of olive oil over medium-low heat until translucent, approximately 5 minutes. Turn off the heat and add the remaining 4 tablespoons (1/4 cup) of olive oil and the balsamic vinegar. In a large bowl, combine the warm wheatberries, sautéed onions, scallions, red bell pepper, carrot, 1/2 teaspoon salt, and the pepper. 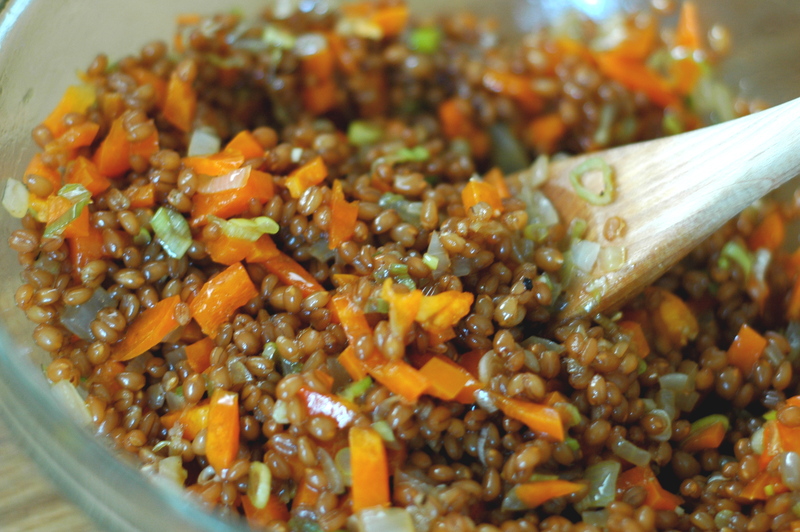 Allow the salad to sit for at least 30 minutes for the wheatberries to absorb the sauce. Season, to taste, and serve at room temperature. This salad keeps well in the fridge for several days and even gets better as it sits.